Home of Andrew & Holly Marmion. History: Purchased in 2008, the house is an Old Style built in 1911. The current owners moved back to their hometown of Pittsburgh from NYC in January 2008 and wanted to acquire the most house for their money. They were searching for a home built before the 1920s with original details and woodwork. 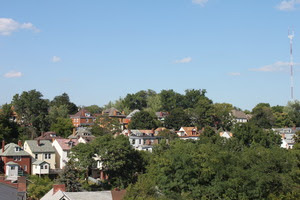 Popular and well developed areas, such as Squirrel Hill, were out of their price range, as well as not in line with what thery wanted to do, which was invest in the City of Pittsburgh and contribute value to a neighborhood. They searched all over the city and stumbled upon Observatory Hill. Neither of them were familiar with the area, so they decided to check it out. The historic house, location, Riverview Park, commute to downtown and price range were a perfect match. The house had only been on the market for 2 weeks and they put an offer in the next day. Renovations: The owners have opened up some walls, gutted the kitchen and refinished it, put in new floors and painted the entire house. The Details: The attic completed renovated, the sidewalk replaced and driveway paved by previous owners. The current owners painted the bedrooms and outside of house when purchased. Woodwork throughout the house is all original, original stained glass above living room window and in landing area of staircase. There are original pocket doors in living room and dining room with original hardware. Kitchen pantry is original with original hardware. There is a unique pass-through hole from kitchen to dining room. All doors in home are original. The entry features original woodwork and a built-in seat. There is original stained glass in landing area. The sitting couch is antique with original upholstery and wheels. The living room has the original pocket doors with hardware. The two couches, table (1800’s) and side table are antiques. Note the beautiful carving on the large table in the living room. The hanging photo is a family heirloom printed in 1886. Fireplace is original woodwork and mantle. Tiles have been replaced.